The start of KAC: a slightly abridged version of Ross Brewster’s great account of the early days! It was a debut performance the word ‘shambles’ might have been invented for. Keswick Amateur Athletic Club made its first appearance before an eager public–three spectators and a dog actually–in a drizzly, grey Lancashire mist at the Musbury Tor Relay race one afternoon in 1974. So recently formed was the club that its yellow and green kit had still not been delivered and it was a rag, tag bunch of hopefuls in tee shirts, old jumpers, shorts of varying length and colour and totally unsuitable footwear, that turned up that day to face the cream of British fell running talent. The top fell running clubs all had a team out for the race. Bolton United even had Ron Hill, the European and Commonwealth marathon champion, in their ranks. There were at least two Fell Runners of the Year in the other teams. Totally unprepared in mind, body and running kit, it all went wrong for Keswick at the start of the second leg. It turned out the club’s runner had forgotten his gear and had to race in a pair of clumping great hiking boots, while his ‘tracksuit’ was actually a voluminous brown raincoat appropriated from his dad’s wardrobe. In the confusion, he had still not removed the overcoat when the first runner came in to hand over. It got stuck over his head, both arms were now unaccountably thrust down the same sleeve, and, like a scene from a TV comedy classic, several runners from rival teams joined in the struggle, tugging and wrestling, to divest the Keswick man of his coat. In the end he set off up the lane, miles behind, still battling with the recalcitrant garment which he eventually cast off and left hanging over a wire fence, to be reunited with it on the return journey. Hopelessly last of course. Lesser mortals would have quit there and then. But a couple of weeks later, lessons learnt, the same four Keswick runners toed the line for the Skiddaw race where, this time, they did not return in such disgrace. This was truly the birth of the new club. But really it all began by accident. A local footballer was looking for some training companions, a few friends joined him on his twice a week runs, and from such simple beginnings they began to hold Sunday afternoon eyeballs-out races over a four mile road course. David Ellison had been a runner, knew a few people in the sport, persuaded Ron Hill to come up one weekend and take the lads out round one of the lakes, had ideas for raising a few quid, entered people for races they never knew existed and, in their right minds, would never have considered taking part in. Perfect. That’s the secretary appointed. Plus the hospitable Ellison family flat, above the town centre shop, was a perfect base for runners to come and go, be fed and watered and kip down overnight. The foursome who ran in that first embarrassing relay, Ellison himself, Ken Cartmell (the man with the raincoat), Kenneth Clark and Ross Brewster, were to form the basis of the Keswick club in the early days. The fun running boom was as yet unheard of and it was not easy to recruit more members. Alan Lowis, the footballer, who in a sense was the instigator of the club, never actually became a member. He preferred banging in goals as the star striker for his team. The sport was still split along amateur-professional lines in the 1970s. 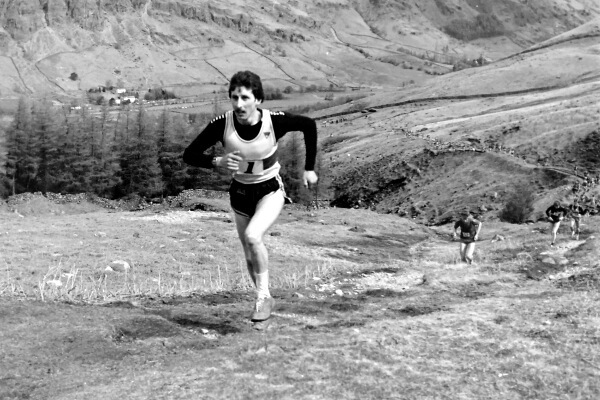 The top Lakeland runners–guides racers as they were known–hardly made more than a fiver from their exploits and when Keswick AAC was established one or two were tempted to seek re-instatement. The likes of Billy Bland, later to join his own local club in the Borrowdale valley, and Kenny Stuart, ran in Keswick’s colours and, as numbers eventually did start to increase, Keswick’s name appeared more frequently in results sheets from races all over Britain. 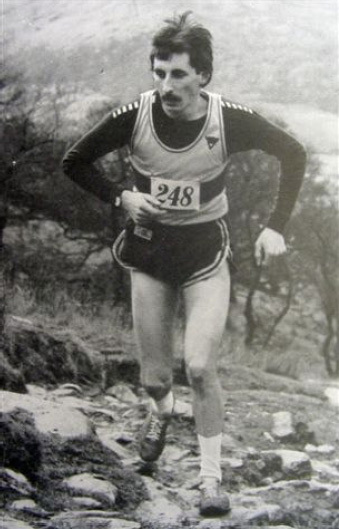 Faithful club men like Pete Trainor and David Moulding turned out regularly while Dave Ellison once ran a marathon(The Maxol in Manchester) in the morning and turned up to run for Keswick in the Saddleworth fell race the same afternoon. The club also had good advice from the likes of Des Oliver, once a winner of the Lake District Mountain Trial, Ken Nicholson and Frank Rush. Although fell running was number one, Keswick also competed on the roads and cross country and even, on rare occasions, at track meetings. Sadly David Ellison, who subsequently moved back to the Manchester area, died towards the end of 2015 after a lengthy period of poor health. His ashes are scattered on Latrigg fell. Fitting as he was one of the Keswick members instrumental in reviving the annual Latrigg Race which was once a feature of the town’s August Monday Sports until the event fell into abeyance. Musbury Tor has thankfully disappeared into the mists of time. However the legacy of David Ellison’s abounding enthusiasm for the sport, along with that of those first few members, is evidenced today by the strength of the modern Keswick Athletic Club–complete with the proper kit!